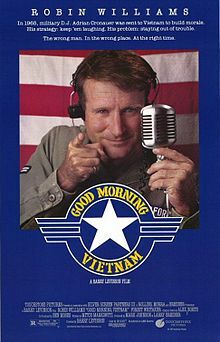 Robin Williams | WHAT A FEELING! Ever since 9:22 p.m., November 15, 1972, there has been an overriding reality in the life of an otherwise ordinary man from the small town of Taft, California. 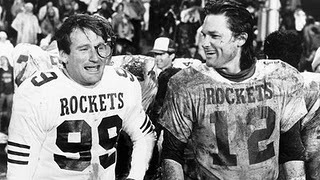 It was at that very moment, 13 years ago, that Jack (Robin Williams) dropped a last-second pass that would have given the Taft Rockets their first-ever victory over the hated Bakersfield Tigers. Instead, Jack muffed the catch, Bakersfield won the high school rivalry again, and Jack was doomed to a life as The Man Who Dropped the Ball. This is the situation for the protagonist of The Best of Times, a spunky, endearing slice-of-life comedy. As the film begins, Jack is recounting a brief history of the town of Taft, which has never seemed to win at anything. In a way, he’s like the town itself—small, unassuming, bloody but not bowed. Jack gets it into his head that he can remove the nagging memory of that dropped ball—extricate himself from “the bowels of hell,” as he puts it—by replaying the game; that is, gathering all the now-paunchy players from the two squads and going through it all again. But he’ll need the help of the greatest high school quarterback in the history of Taft: Reno Hightower (Kurt Russell). Reno resists, but a terrorist attack by a man dressed in a tiger suit—everyone thinks it’s a Bakersfield bad buy, but it’s actually Jack, trying to whip up enthusiasm for the game—changes Reno’s mind, and the preparations for the battle begin. These are amusing; but at least as important to the heart of the film are the marital tribulations of Jack and Reno. Jack’s wife (Holly Palance) has thrown him out of the house because of his insistence on the replayed game. And long-standing problems have driven Reno’s wife (Pamela Reed) to temporary residence at the Top Hat motel. A sequence with the two couples coming together for a reconciliation dinner is the comic centerpiece. The wives swig wine from the bottle in anticipation, the husbands try to bolster themselves with a game plan (“Be bland, but strong—careful, but with a touch of reckless”). The women have deliberately scheduled the dinner for a Monday night, with the attendant televised football game; the dinner is a test to see whether the boys can resist the temptation. If that that setup seems a bit familiar, the results are funny nevertheless. It all builds up to a conclusion that is also familiar and predictable: Every person who watches this movie knows that the big rematch will come down to a single play in which Jack will either redeem himself or become the goat of all time. The plot may strike some as formula—how many movies can we take with a big sporting event as the finale? And yet The Best of Times has a wonderful freshness; it combines humor and heartache in a beguiling combination—in scenes such as Reno’s off-key rendition of “Close to You” at his wife’s motel room door, or the touching entreaty Jack makes to his wife in the gymnasium restroom during a pregame sock-hop. Director Roger Spottiswoode (Under Fire) has a keen sense of how people talk, and behave; and he’s well-served by his actors. Williams and Russell have nice chemistry, and Palance (currently appearing in the Seattle Rep’s The Real Thing) and Reed (The Right Stuff) are attractively unglamorous. The Best of Times doesn’t break new ground, and it’s a decidedly self-effacing work. But it’s a tremendously agreeable movie, and very easy to enjoy. Lovely movie. I didn’t mention its screenwriter, because like most people I didn’t know who Ron Shelton was; Bull Durham was still a couple of years in the future. But of course Shelton’s spirit is all over this film, in the best ways. As for the director, this seemed like the moment Spottiswoode was going to settle onto the A-list, which didn’t happen although he did get some high-profile jobs, including a Bond picture. He was married to Holly Palance (yes, daughter of Jack), who didn’t really stick with the movie thing. This film just radiates a good feel, and everybody’s doing top-line work; of course, it didn’t do anything at the box office.